A year ago, Vice President Mike Pence told the country’s mayors to a expect a “big” infrastructure funding proposal from the White House. An “infrastructure package that will meet the needs that face too many communities and oftentimes stifle growth,” Pence said, at the U.S. Conference of Mayors’ winter meeting in the Capital Hilton in 2017. 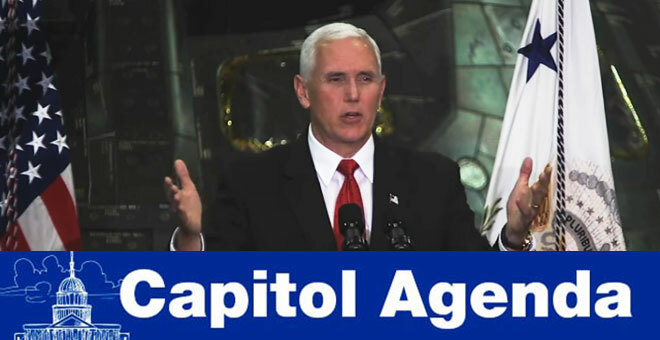 Pence’s sentiment coincided with President Donald Trump’s promise of rolling out the proposal within his first 100 days in office. The mayors last year told the Trump White House they needed additional funding for large-scale maintenance projects, as well as funding for transportation grants. A few weeks later, the administration proposed to cut such grants and delayed the infrastructure plan’s rollout. Fast forward to now, and the mayors are still waiting for the White House’s “big” infrastructure plan as cities continue to cope with highway congestion, and they say key infrastructure projects struggle to gain financial assistance. Jan. 23, 2:30 p.m.: Surface Transportation and Merchant Marine Infrastructure, Safety, and Security Subcommittee meets for “Surface Transportation Security: Addressing Current and Emerging Threats.” Administrator of the Transportation Security Administration David Pekoske is among the witnesses. Jan. 24, 10 a.m.: Senate Commerce Committee schedules a field hearing on driving innovation and federal policies in advance of the 76th Washington Auto Show at the Walter E. Washington Convention Center. Jan. 24, 11:30 a.m.: The U.S. Conference of Mayors hosts its annual winter meeting press conference at the Capital Hilton Hotel in Washington. Jan. 25, 8:30 a.m.: The Washington Area New Automobile Dealers Association holds a MobilityTalks International Forum in advance of the 76th Washington Auto Show featuring Gov. Rick Snyder (R-Mich.). Jan. 25, 3 p.m.: White House infrastructure policy adviser D.J. Gribbin participates in a panel discussion at the U.S. Conference of Mayors’ winter meeting. Jan. 26, 10 a.m.: The Brookings Institution puts on a panel on “What’s next for Trump’s regulatory agenda.” Speakers will include Office of Information and Regulatory Affairs Administrator Neomi Rao, and Ted Gayer, senior fellow, vice president and director of the Brookings Economic Studies Program. AMAZON: Over the past two years, Amazon.com has dabbled in the transportation and logistics industry. But recently, the e-commerce behemoth began to directly broker freight to truck drivers, rather than solely rely upon third-party firms such as C.H. Robinson Worldwide, Transport Topics has learned. ELD WAIVER: The Federal Motor Carrier Safety Administration has granted Old Dominion Freight Line Inc. and the Motion Picture Association of America exemptions from hours-of-service regulations pertaining to the electronic logging device mandate. ‘DANGER ZONE’: NAFTA talks are entering a pivotal moment as the U.S. turns up the pressure on Canada and Mexico to radically alter the trade pact in favor of American interests. A senate hearing on glider kits will be held next week, sources tell us. We all serve in co-equal branches, the House, the Senate and the president. We all make our independent decisions. I work with the president on this issue. I work with Senate and House Republicans. I’m more than happy to sit down with any Democrat as well. In November, Vox produced an explainer on ELDs. The Eagles have a fan in Rep. Charlie Dent.